Betsy's Autumn [G8702] - $12.00 : Yarn Tree, Your wholesale source for cross stitch supplies. 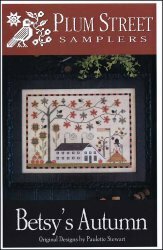 Cross stitch pattern from Plum Street Samplers. A large home sits in the countryside with pumpkins decorating the sidewalk. A large tree with it's long branches, holds beautiful autumn leaves. The flag proudly blows in the fall breeze as the birds sign a pretty melody. You can't help but "fallin" in love with this design! Stitch count 184w x 130h.